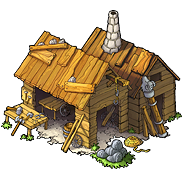 Siege engines like catapults and rams can be built in the workshop. The higher its level the faster units can be produced. Also, at higher levels you can build other kinds of equipment once you have researched it in the academy.